Shockingly, I'm not really a superstitious person or what people would consider to be conventionally superstitious. I don't believe black cats are bad luck (my dad has two black cats and they're little loves) or that stepping on a crack will break my mother's back. I do believe in more spiritual practices that some might consider superstitious. I believe in burning sage to cleanse homes or specific rooms or spaces. I believe in spirit. I believe in mediums (hello Theresa Caputo my favorite person alive) and that we all have the ability to connect with our loved ones who have passed on. Something that I do believe in is in the power of dimes. This is something that is specific to my family and the family of which the story originates. The story goes like this: one of my cousins lost her son (my third cousin... we're Italian so we don't count first, second or third cousins.. we're all just cousins) when he was only fifteen years old in a hit and run accident. After she lost him she was dragged to a support group she wasn't sure she'd like. While she was there she got to talking to another woman who had also lost her son. The woman told her a story about how when her son was little she would give him one dollar has his allowance. He would bring it upstairs to his room and bring down a dime and give it to his mother saying, "here Mom... this is for all that you do for me" and she'd smile and she saved those dimes. After he passed away, she went into his room to vacuum, like she always did when he was alive, and after she vacuumed the whole floor and was about to leave she saw a dime on the floor with his birth year on it. After she told my cousin this story she told her to look for dimes for herself and know that when she saw them it was her son speaking to her from heaven. I remember my cousin telling me that she didn't know what to believe. She didn't know if this was just a story a grieving mother was using as a cushion to get through each day or if there was something to believe in the story she was told. Well, one day after she had just swept the laundry room she accidentally knocked my cousin's (her son's) jacket off a hook and onto the floor. She picked it up and went into the other room to look through the pockets to see if there was anything of him still left in there as well as to just sit with it and smell it. When she went to hang it back up she looked on the floor, that she had just swept, and there was a dime with her son's birth year on it. From there on out dimes have become a symbol for my entire family that someone you love is trying to speak to you from heaven. We are always finding them in the most random places especially just after we clean an area. We'll turn back around and there will be a dime. I also never find any other coins. I never see pennies or nickles laying around but we do see dimes. Maybe we're a little crazy, we know we are, and that's okay (I know my boyfriend thought it was a little nuts until he started finding them too and now he's on board). We find comfort in it and we always love telling people the stories of where we find them. 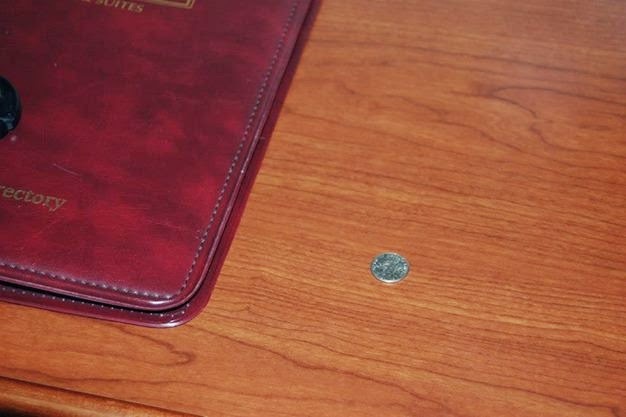 Like, my cousins found dimes in the church pews at my grandfather's memorial service which brought my grandmother a little bit of comfort on one of the hardest days of her life. Whenever I see them it brings a huge smile to my face. They're a reminder that our loved ones are always with us. My cousin never did go back to that support group but she always looks for dimes. I found this dime while I was packing for a trip to Florida with my boyfriend's family. 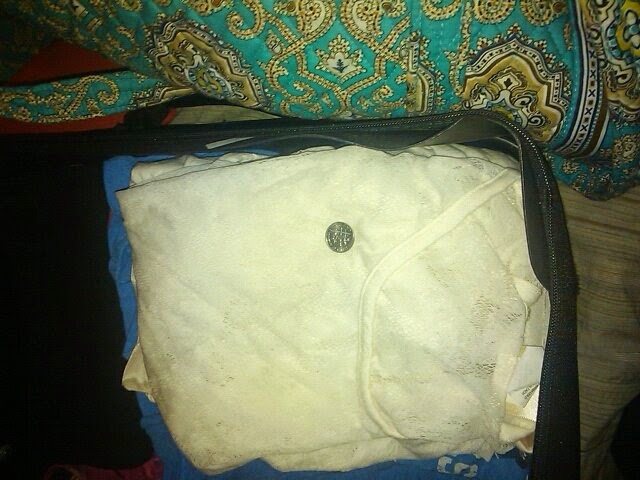 I put that white shirt down, left to get something else, and when I got back there that was. This dime I found right after we checked into our (freshly cleaned..) hotel room in South Dakota. I walked past the desk to put my suitcase down and saw it. What are you guys superstitious about? Link up with Taylor, Helene, & us for #blogtober14! Thank you, doll :) it definitely means a lot to our family. I love this story! I'll be on the lookout for dimes from here on out! Eee! I love it, yay!! This is such a neat story! I love this type of stuff and now I hope I find dimes! Isn't it cool?! I hope you do! !